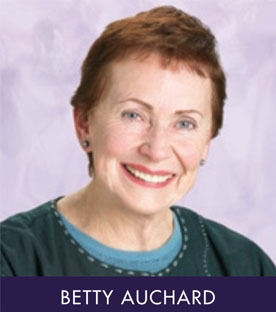 Betty Auchard’s first book, Dancing in My Nightgown was published when she was seventy-five. It’s an upbeat, humorous collection of stories that reflect her experiences while learning how to be a single woman after the death of her husband. It earned and Independent Publisher Award (IPPY Award) in the memoir category. At the age of eighty, her second memoir was published. The Home for the Friendless tells poignant but funny stories about growing up with wacky parents during the Depression and WW2. Mom and Dad loved each other but couldn’t stay married. They divorced and remarried each other three times trying to make it work, and family life was like a TV sitcom. During one of their longer separations, Betty and her brother and sister lived in a 1930s version of a children’s shelter called The Home for the Friendless. At the Home, life was stable for two years. At eighty-five, Betty published her third memoir titled Living with Twelve Men, the tales of how she, a nineteen-year- old bride, was whisked off to a church college in York, Nebraska where her husband was a “house father” to twelve male students who lived upstairs. Everyone on campus was educated and religious. In order to “blend,” Betty pretended she was smart and acted kind of holy. Betty’s books, eBooks, and audio books are available on Amazon.